Here is another wonderful tutorial from Dollar Store Crafts blog! We love them - you absolutely need to check them out...now. Go on, you won't regret it. Then come back here and enjoy the felt ornaments. I made these tree ornaments from a felted/fulled wool sweater last year and gave them to my family members for their handmade gifts (we try to exchange primarily handmade). You can find wool sweaters by the dozens at thrift stores (although, I admit, they are probably not commonly represented at dollar stores!). Wash in hot water and dry in the dryer to shrink them into fabric that can be cut and sewn and won't unravel. 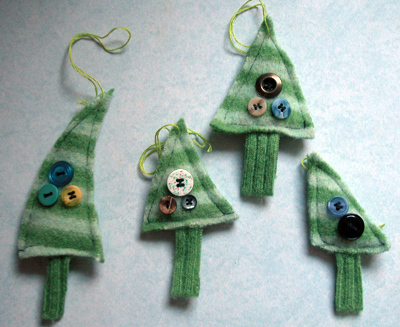 These cute trees are a great way to show off your button stash, too! Handmade ornaments are also a great gift for co-workers or people who you need to give a token gift to, but who you don't want to spend a lot of money on. Total cost: $4 for about a hundred ornaments (if you use the whole sweater to make them)! Wash and dry wool sweater to felt it. Repeat if necessary. Cut tree shapes (triangles) and trunk shapes. I used the contrasting cuff cut in strips for the tree trunks. Use two matching triangles and one trunk piece for each tree. Sew buttons as desired on front tree triangle piece. Sandwich tree trunk piece at bottom between front and back tree pieces, and ribbon for hanging at top. Triangle pieces should be placed with right sides facing out. Sew around perimeter of triangle.